(1:45 p.m. EST) -- Celebrity Millennium is returning to service after a 35-day dry dock that saw all staterooms and suites completely redesigned, as well as the addition of The Retreat for suite guests. The refurbishments, which also included upgrades to the restaurants, bars, lounges, spa and casino, are part of the line's $500 million Celebrity Revolution program. "This is such an exciting moment for us as we finally get to share the new Celebrity Millennium with the world," said Lisa Lutoff-Perlo, president and CEO of Celebrity Cruises. The ship "has been transformed from top to bottom. I want to share my deepest gratitude with the teams who have worked so hard to make this happen, and I can't wait for our guests to experience this revolution in travel for themselves." Among the most prominent upgrades was the redesign of every single cabin onboard. 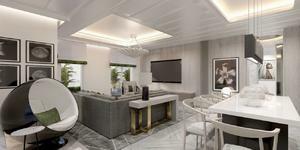 Celebrity worked with interior designer Kelly Hoppen, who designed all the suites on Celebrity Edge, to come up with the look for Millennium's suites as well as The Retreat. The Retreat Sundeck, an exclusive open-air lounge, features a hot tub, cabanas, loungers and more. The space is in addition to an interior lounge (formerly Michael's Club), where suite-class passengers can find free drinks, gourmet bites, live entertainment and concierge services. 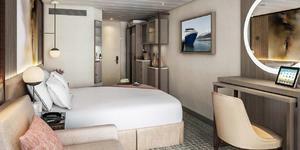 Standard cabins onboard Celebrity Millennium were also refreshed and outfitted with Celebrity's eXhale bedding, redesigned bathrooms with all-new finishes and fixtures, and RFID lock technology for digital key access. A total of 30 new staterooms were added to Millennium during the dry dock, including 13 AquaClass rooms, seven ocean-view cabins and 10 inside rooms. 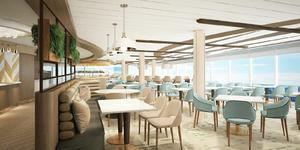 Among the changes made to the dining venues onboard, the Oceanview Cafe received a new open concept with increased seating options and an expanded globally-inspired menu, while the main restaurant got more seating and updated fixtures. The Sunset Bar was also redesigned and now features a larger variety of seating options, while the redesigned Rendezvous Lounge got an enlarged bar. Celebrity Millennium's refurbishment -- the first under the Celebrity Revolution program -- took place at the Sembawang Shipyard in Singapore. Celebrity Summit will be the second ship in the fleet to undergo the knife; it is already in dry dock in the Bahamas. Seven more ships will be modernized by 2023.